All artwork © Britto Central, Inc. All rights reserved. SEOUL, Jan. 5, 2013 ㅡ LG Electronics (LG) will display its new Ultra HD TV lineup at CES 2013 in Las Vegas. The original 84-inch Ultra HD TV will be complemented by 55- and 65-inch screen models. The new sizes offer the same stellar resolution and immersiveviewing experience as LG’s 84-inch Ultra HD TV, the winner of the “Best of Innovations” in the Video Display category at the 2013 International CES® Innovations Awards. LG was the first company to successfully commercialize Ultra HDTV technology, introducing the immersive set for sale to the public in August of this year. All three models in the Ultra HD TV series boast the advanced Triple XD Engine. This exceptional picture processing technology creates astonishingly vivid images,with 8 million pixels per frame; four times the resolution (3840×2160) of Full HD TV panels. Additionally, the Resolution Upscaler Plus takes content of lesser image quality and rendersit in high detail. LG’s newest Magic Remote allows the user to intuitively navigate the Ultra HD TV’s smart onscreen interface. The company’s Smart TV ecosystem now includes approximately 1,400 apps and access to a growing collection of premium content services, such as 3D Worldand Game World. SmartShare Plus connects users to even more media and entertainment options. This feature set offers a range of connectivity options such as Wi-Fi and Intel’s Wireless Display(WiDi), which enable content to be transferred from portable devices such as laptops, mobile phones, tablets and other devices. LG has equipped its Ultra HD TV swith CINEMA 3D technology, bringing 3D entertainment into the Ultra HD arena. Astounding screen resolution in combination with 3D effects provides an immersive experience, which is truly beyond imagination. 3D Depth Control allows viewers to fine-tune the perceived distance between objects on the screen, for a customizable 3D experience. 3D Sound Zooming furthers the sense of being ‘in the action’ by analyzing onscreen objects to generate sound in accordance with their virtual location and movement. In addition, the Dual Play feature allows opponents playing multiplayer games to simultaneously see different images on the same screen– effectively making split-screen gaming a thing of the past. LG’s Ultra HD TV also features a 2.2 Sound System. Consisting of two 10W speakers and two 15W woofers, the sound system produces a lush audio experience that perfectly complements the extraordinary onscreen visuals; creating a true theater-like experience in the home. 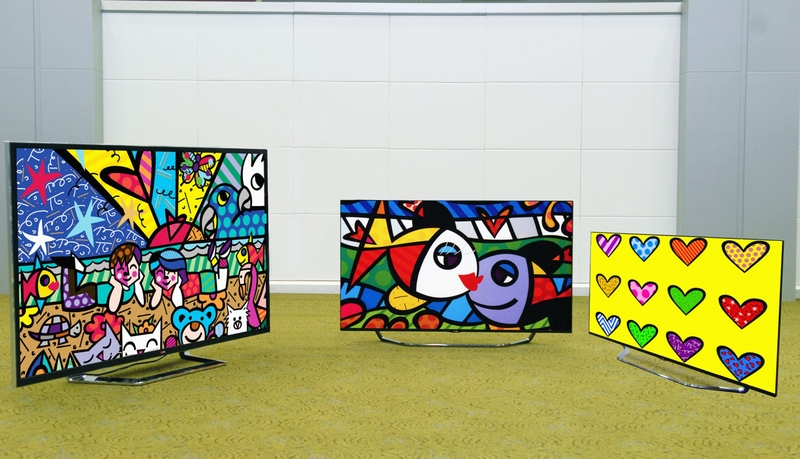 At CES 2013, LG will proudly showcase the vibrant neo-pop artwork of Romero Britto on its stunning lineup of Ultra HD TVs in the Ultra HD Gallery Zone. His uplifting paintings are visual expressions of pure happiness and hope for humanity. LG’s next generation picture technology is able to convey the artist’s dynamic vision with complete fidelity. Meanwhile, the Ultra HD Content Zone will show CES visitors just how serious LG is about securing top quality, next generation content. The company has already formed an Ultra HD content agreement with Korea’s top broadcaster, KBS (Korea Broadcasting System), and is actively initiating partnerships with other global content providers and broadcasters.